The off-season can be a great time to get your caravan serviced, ready for the new season ahead. 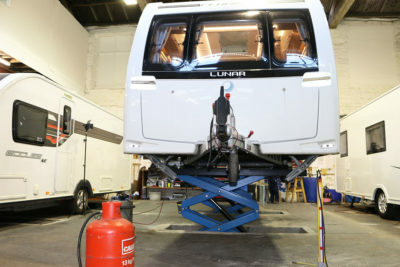 We spent a day at Peter Roberts Caravans and Motorhomes to find out more about caravan servicing. 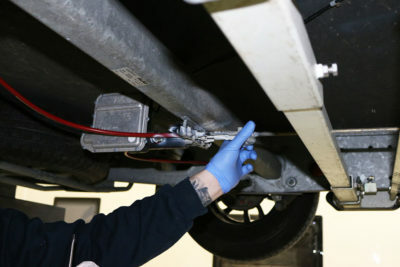 Why is it important to have your caravan serviced? It’s really important to have your caravan serviced every year in order to keep it safe whilst on your travels and also to maintain any manufacturers’ warranties. A service will also look at wearable parts, such as breakaway cables, brake pads, and one-shot nuts. Where do you go to get your caravan serviced? 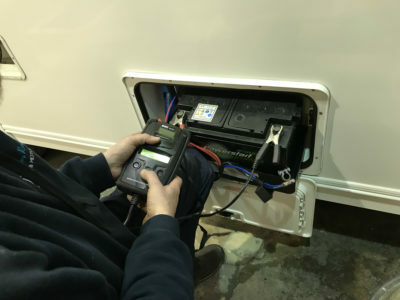 You can get your caravan serviced anywhere, but to maintain any caravan manufacturer warranties it’s really important to take it to a dealer or mobile servicer which is part of the Approved Workshop Scheme and is therefore authorised by the National Caravan Council. An Approved Workshop will undergo rigorous checks and their engineers are fully qualified to carry out a service and keep your caravan safe. It’s not a legal requirement to have your caravan serviced, but we recommend you have it looked at every year, to keep it safe and roadworthy. A caravan service will also help you identify any small problems before they escalate into bigger and more costly issues. What is checked in a caravan service? 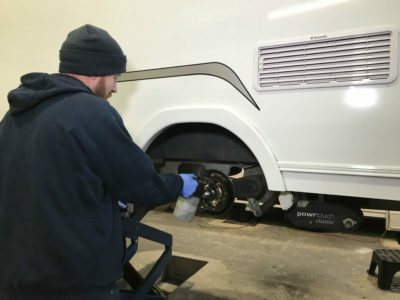 The things that are covered in a caravan service, include the hitch and chassis; brakes and wheels; gas and electric; damp, water ingress; windows and doors; and a check of the bodywork. In fact, there’s a long list of over 100 things that are checked in a caravan service. How long does a caravan service take? A service takes around four hours. But it can be a little bit longer if there are other issues that need to be looked at. This is the same for a single axle and a twin axle caravan. Try to keep the floor clear. Arrive at the agreed time and dates. 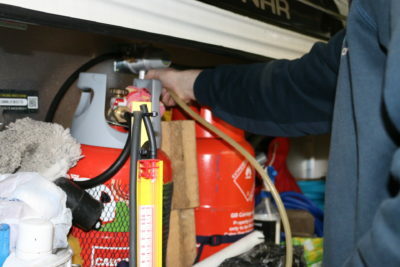 This is really important to keep the flow of the caravans in and out of the workshop. Make sure your lockers aren’t too full so that the engineer can get to check the electrics, as well as get in and out of the lockers, look underneath the bed, and in the front lockers etc. Let your dealer or mobile engineer know in advance if there are any issues that you need them to look at. For example, any warranty issues or any other problems that you might have with your caravan. How much does a caravan service cost? The cost does vary from dealer to dealer and throughout the UK the prices can vary. It also depends on whether you own a single axle or a twin axle caravan. Prices for an average service can cost between £200 and 250. As stipulated in your caravan insurance policy you do need to keep your caravan in a safe and roadworthy condition. So we recommend having your caravan serviced annually by a qualified caravan service engineer. Unless I have missed something, I cannot see what else an annual MOT check would do that a full service doesn’t. Perhaps the industry should lobby Government to say that an annual service by an approved dealer is an MOT. That would make sure that caravanners do indeed have their outfit properly serviced. Although not a legal requirement to have a service every year, It is vitally important for one’s family safety. Particularly with newer more complex caravans and older vans, even if only used occasionally as brakes and gas checks are essential. I find that if you have your van serviced halfway through the season, if anything goes wrong in the early part of the season you can get it done on the service because reason being you drained down the system and then you wake it up & use the caravan for a few outing giving time for things to settle down, that’s my thinking and opinion and it works fine for me, but not for everyone. Good advice, informative and concise with nearly all queries dealt with.Message should encourage us to get our ‘vans serviced for the coming season soonest. Good article. Always get your caravan serviced especially the running gear for safety reasons.